Traditional measurement techniques for acquiring surface temperature distributions on models have utilized embedded arrays of thermocouples and RTD’s. This requires significant construction and setup time while producing data with limited spatial resolution. 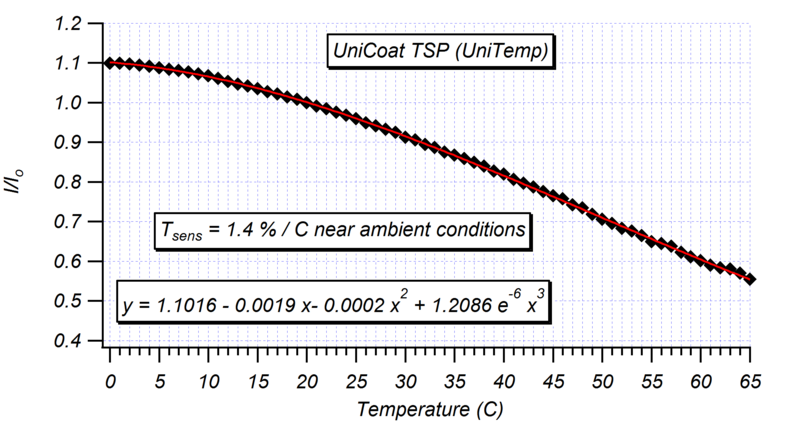 An alternative approach is to use temperature sensitive paint (TSP) to measure surface temperature. The advantages of temperature sensitive paint include non-intrusive measurements and high spatial resolution when compared to conventional measurement techniques. Much like pressure sensitive paint, image based temperature measurements using TSP are accomplished by coating the model surface with the paint and illuminating the surface with an LED of the appropriate wavelength. The luminescence from the surface is recorded using a CCD camera through a long-pass filter to separate the luminescent signal from the excitation light. The luminescence from the TSP is a function of the local temperature, and therefore, each pixel on the camera acts as a thermocouple. TSP is made up of a luminescent molecule within a polymer binder. Generally, a binder that is impermeable to oxygen is preferred. The basis of the temperature sensitive paint method is the sensitivity of the luminescent molecules to their thermal environment. The luminescent molecule is placed in an excited state by absorption of a photon. The excited molecule deactivates through the emission of a photon. A rise in temperature of the luminescent molecule will increase the probability that the molecule will return to the ground state by a radiationless process, this is known as thermal quenching. The temperature of the painted surface can be measured by detecting the fluorescence intensity of the luminescent paint. 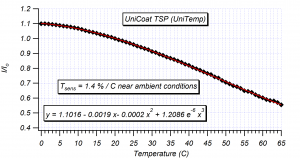 To determine this intensity versus temperature relationship, a sample of the TSP is placed in a calibration chamber. The sample is exposed to a series of temperatures and the luminescent intensity of the sample is recorded. For reasons that will be discussed later, each intensity is normalized by the intensity at a reference condition and plotted versus temperature. A plot of the calibration of a typical TSP is shown here. Luminescent intensity distribution is not only a function of the temperature. In fact the luminescence from the painted surface varies with illumination intensity, paint layer thickness, and probe distribution. If we assume that these parameters don't vary in time however, they can be eliminated by taking the ratio of the image at the test condition or wind-on image to an image taken at a known reference condition or wind-off image. This wind-off to wind-on ratio is often referred to as radiometric TSP.